Soak cedar grilling plank in water to cover 2 hours, keeping it immersed by placing a heavy pan or bowl on top of the planks. Prepare grill for direct-heat cooking over medium-high heat for gas (or medium-hot charcoal – open vents on bottom and lid of charcoal grill). Whisky together mustard, honey, thyme, zest, and 1/2 teaspoon each of salt and pepper. Spread mixture on flesh side of salmon and let stand at room temperature 15 minutes (discard any leftover marinade). Put salmon on plank, skin side down (if salmon is too wide for plank, fold in thinner side to fit). 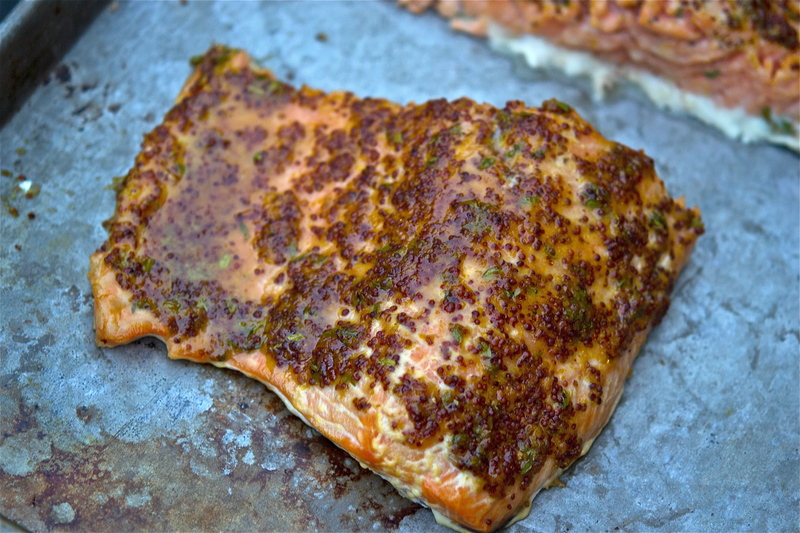 Grill, covered with lid, until salmon is just cooked through and edges are browned, 13 to 15 minutes – check for doneness based on how easily a fork can slide into the meat. Let salmon stand on plank 5 minutes before serving.